Monday January 27 1908 It was very cold this morning. I did a little mending and the regular house work. Will went to town in the afternoon. I put in all the afternoon making [hominy?]. Made tatting in evening I had a letter from Lou Reeves Simpson I have at last located her at Seibert Colorado living on a ranch farm. Tuesday January 28 1908 The wind blew a gale all day. I had churning to do and aside from that put in my time with the regular work. I fried a bit lot of doughnuts. I sewed some & worked on tatting. The buys busy about the place. I finished a book I was reading in the evening. Wednesday January 29 1908 It was a fine winter morning. I hurried around so I got of for town at 9.37. I did some shopping got me a pretty new dark silk waist. Stopped at Fannies on the way over home I did some sewing on Hatties machine. Went to town at 4 oclock to the Dr office I did not come home till 5.30. Busy all evening. I wrote Mrs Brown tonight. 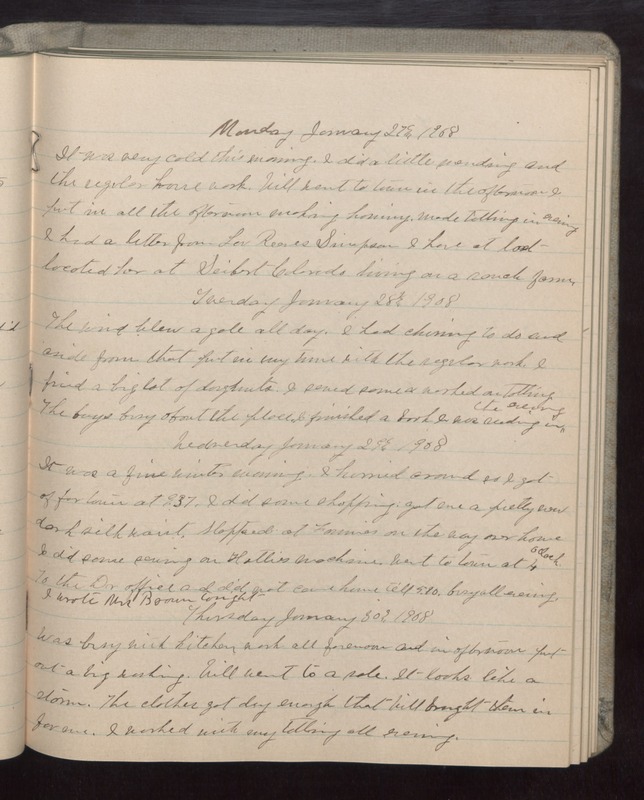 Thursday January 30 1908 Was busy with kitchen work all forenoon and in afternoon put out a big washing. Will went to a sale. It looks like a storm. The clothes got dry enough that Will brought them in for me. I worked with my tatting all evening.